Nar Phu trek is also a part of Annapurna region. The word Annapurna is a Sanskrit word. It has two words Anna + Purna separately. Where "Anna" stands for GRAIN and "Purna" stands for FULL, thus the meaning for the word is "Full OF GRAINS" in common Nepali language. This is also popular as “GODDESS OF THE HARVEST” in Nepal. 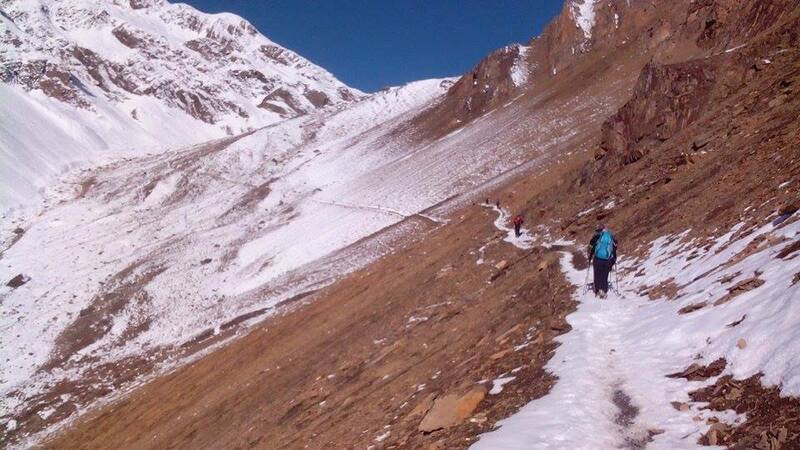 Nar Phu valley trek is wild and unexplored trekking routes in Nepal situated in the Manang District. Nar Phu trek is perfect for travelers who want to discover and explore Annapurna Circuit. As well as trekkers, nature lovers can explore an untouched valley, a rough and wild trek. This trek leads you to the exotic Nar Phu valley which lies in a remote corner of the Annapurna region. This trekking route opens for trekkers in 2003 AD. Nar Phu valley is a model trek for those trekkers who have time and desire to venture into some of the less trodden remote regions of Nepal. It is also a spectacular trek route of Nepal with a spectacular view of ethnically-Tibetan inhabitants. This is a trek that combines remote villages, narrow canyons, lovely forests, amazing rock formations, yaks, Gompas and unique Himalayan cultures. Trekking to Annapurna circuit, the bridge leading over the Maryland River to the steep portals of the Nar Phu valley system is easily missed. But although the entrances are narrow and forested. Valley above opens up to the huge expanse of high snow-peaks, ancient villages, and high altitude grazing settlements. This decision to open up Nar and Phu by Nepal Government has evoked little enthusiasm among the villagers. A path leading from the Nar-Phu valley into Tibet had made them dependent on the salt trade and still today yak herding is the basis of their livelihood. Few trekker views this exotic land offers medieval Tibetan culture in undisturbed form, dramatic mountain views, and great alpine scenery. Snow leopards and blue sheep are rarely seen in this area. Nar-Phu valley trekking begins from Koto via walking through a unique Marsyagndi valley. Day 05: Trek to Bahundanda (1310meter), overnight at guest house. Day 06: Trek to Chyamche (1430meter), overnight at guest house. Day 07: Trek to Dharapani (1920meter), overnight at guest house. Day 08: Trek to Koto (2600meter), overnight at guest house. Day 09: Trek to Dharmasala (3230meter), overnight at guest house. Day 11: Trek to Phu Village (4050meter), overnight at guest house. Day 12: Excursion around Phu valley, overnight at guest house. Day 13: Trek to Junam (3550meter), overnight at guest house. Day 14: Trek to Nar Village (4150meter), overnight at guest house. Day 15: Explore Nar Village, explore the nature, overnight at guest house. Day 16: Trek to Nawal (3675meter) after crossing Kang-La (pass) (5315meter), overnight at guest house. Day 17: Trek to Manang (3550meter), overnight at guest house. Day 18: Trek to Ledar (4250meter), towards Thorong-La (pass), overnight at guest house. Day 19: Trek to Thorong high camp (4800meter), overnight at guest house. Day 20: Trek to Muktinath (3800meter) after crossing Thorong-La 5416-meter (Pass), overnight at guest house. Day 22: Trek to Jomsom (2713meter), overnight at guest house. Day 25: Transfer to airport for your onward destination. Trekking Permit: September to November per week per person US$ 90 and December to August per week per person US$ 75 Or equivalent convertible foreign currency. Note: If the above dates does not meet your needs, we can design tailor made travel plans based on your interest and timing.